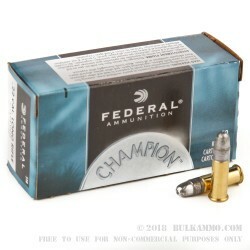 Federal Champion ammunition is a great choice for precision shooting on a budget. Each 500 round brick contains 10 boxes of 50 rounds each. These .22 LR cartridges fire a 40 grain lead nosed bullet at a muzzle velocity of 1,240 feet per second. This puts it in the "high velocity" category. This ammo is loaded in Anoka, Minnesota by Federal Premium Ammunition. Federal has been around since the 1920s and supplies ammo to competitive shooters, hunters, CCW holders, and other gun owners as well as law enforcement and the military. 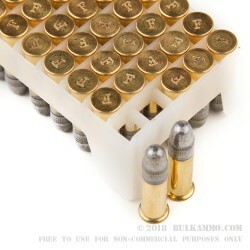 In my opinion acquiring ammo is better than acquiring gold! It’s really hard to kill game with gold. Great deal. Fast and cheap. .22 cal's are for plinking fun. Overall satisfied. Q: I live in California and searching for 23lr fir target practice. 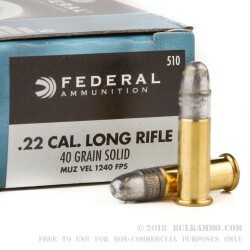 Can I purchase 500 Rounds of .22 LR Ammo by Federal - 40gr LRN ? A: Hello Trish! I appreciate you reaching out to us about that. We do currently have plenty of .22 LR ammunition in stock on the website. We can ship to most areas of CA without an issue. If you have any other questions or need more information, please do not hesitate to ask! Q: What's the intended use for this compared to Federal 36gr CPHP? The listed velocities appear very close, as does the price. A: Relaxed target shooting, plinking, hunting small game, and pretty much anything else you would do with a .22 rifle. Both these loads are a great value. Q: Does this bullet have a wax coating, hard to tell from the photo? A: No, this Federal Champion ammo does not have a wax coating. Q: These are listed as "high velocity" what is their listed velocity? Are these the equivalent to the Federals that Marlin recommends for their autoloaders? A: The velocity of this Federal Champion ammo is 1240fps and should offer comparable function in self-loading rifles to other high-velocity 22LR ammo.